The new Brussels campus – featuring the Centre for Financial Services will be housed in the recently renovated Manhattan Centre in the north end of the city. It’s another step in the process of Vlerick’s move to establish itself as a top tier business school and another part of the school’s rebranding. The new ‘Centre for Financial Services’ is a combined effort of practical everyday knowledge and advanced education, whose goal is to produce high quality research, teaching, and thought leadership in the world of Finance. A. T. Kearney has been involved with Vlerick since the beginning, but unlike other Vlerick partners, Kestens had a different vision in mind when it came to supporting the project. He wanted to become ‘the knowledge partner’, so creating a bilateral exchange of experience and forward thought. 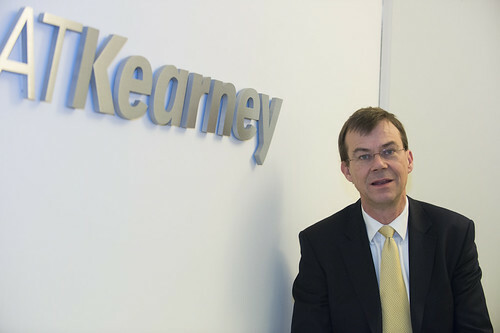 A. T. Kearney certainly has the credentials to be the knowledge partner when it comes to talking about finance, having recently completed a major project for the European Union. With the public debt crisis nearly spinning out of control, A. T. Kearney was engaged to assist in creating a solution. The result was the creation of the European Stability Mechanism, similar in design to the International Monetary Fund, but geared for the member nations whose currency is the Euro. Amazingly, the company beat the projected timeline by some ten months and implemented the process in a mere eight months. Since then, financing has been provided to countries such as Greece, Spain, Ireland, and Portugal with Greece already seeing a sixteen percent reduction in public deficit to approximately four percent of GDP - a remarkable result. The creation of this international institution is aiding in stabilizing the currency and returning confidence to the market. “Vlerick is a great network of people and we wanted to be a part of that,” says Kestens, when asked for the motivation behind his close involvement with the new Brussels campus. “We are opening our network of executives and contacts, and providing content to the debate so that we can demonstrate that the Centre for Financial Services really does provide leadership,” he confirms. How does a consulting firm such as A. T. Kearney benefit from this knowledge partnership? “Well for us, Vlerick is very important as a recruiting ground. And besides that clients want expert knowledge, they want experience, and they are very savvy as to where to go when they want a certain type of expertise,” replies Kestens. This knowledge partnership has recently been seen on the forefront of European economics with the “Policy in Practice” forum. A. T. Kearney, along with Vlerick, combined efforts with the Centre for European Policy Studies, an independent Brussels-based think tank, in an effort to more fully understand the markets of Europe as they stand today, but also to begin the process of preparing for how those will markets will change over time.